Manhattan Community Board 6 and a few local politicians definitely do not want to see an 850-foot condominium tower rise at 3 Sutton Place. The board, under pressure from neighborhood activists, signed off on a rezoning plan that would impose a height cap of 260 feet on new buildings in Sutton Place. Neighborhood group the East River 50s Alliance wants to prohibit all commercial development unless it is for “community uses,” and also set a limit on all new development to around 25 stories. 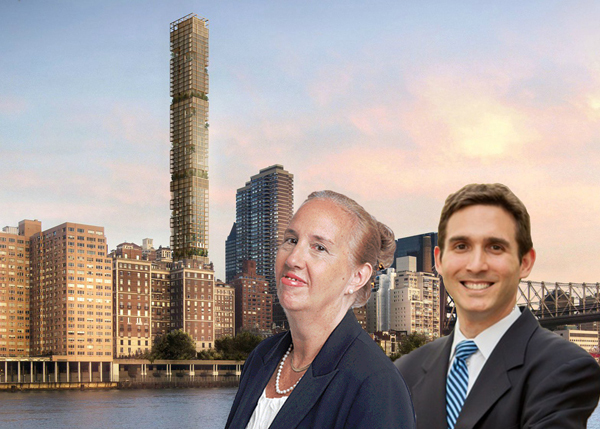 The plan — which has the support of officials like State Senator Liz Krueger and City Council members Dan Garodnick and Ben Kallos — will now be sent to Manhattan Borough President Gale Brewer, who is likely to approve it, Real Estate Weekly reported. The plan will also need to pass City Council before it can go ahead. The area is zoned R10, which means there is no limit on building heights. Under this new proposal, buildings’ floor-area ratio would go from 12 to 13. However, 20 percent of any new development would need to be put aside for below-market-rate housing. If the plan goes ahead, it would drastically affect Gamma Real Estate’s stated plan for a 844-foot tower at 3 Sutton Place. N. Richard Kalikow’s firm paid $98 million for the site and air rights last year after Bauhouse Group’s Joseph Beninati defaulted on his $147 million, high-interest loan on the property and filed for bankruptcy. Gamma’s president Jonathan Kalikow said the community board’s approval of the plan “threatens the future of projects like Sutton 58, but also could inflict long-lasting damage” across the neighborhood.